August 11 is National 811 Day – perhaps the best day of the year to remind everyone about contacting 811 before digging for any reason. How long can you live comfortably without water, sewer or power? If communications lines go down, so do telephones, computers and mobile devices. Accidentally striking an electric or gas line can seriously or fatally injure you or others. Even working with hand tools such as a shovel or digging bar is risky if you don’t know what’s located below the surface. Thousands of miles of underground lines, pipes and cables were installed across Arizona years before development occurred. Today, that complex network of infrastructure is buried beneath our homes and schools, businesses and roadways, parks, open spaces, forests and farms. Over time erosion, grading, construction activity and landscaping can impact utility depth. That means utilities might be more shallow or deeper than expected. The key to digging safely is knowing what’s below, and that’s why 811 is so important. Arizona 811 (formerly Arizona Blue Stake) was established in 1974 when the state’s “Call Before You Dig Law” was first enacted. Through our Call Center and online tools, we facilitate notification to utility owners and operators statewide when anyone plans to dig where their facilities are buried. We now process close to 500,000 utility-location requests annually and provide more than 3.5 million notifications to utility owners and operators, including cities, towns and counties that provide water and sewer services. In accordance with the law, utility owners and operators will locate and mark their facilities with paint or flags in different colors to indicate facility type: red is electricity; yellow is natural, chemical or liquid gas, oil and fuel; orange is communications lines and cable TV; blue is water; purple is reclaimed water; and green is sanitary sewer. The marks help you identify where you need to avoid digging or dig with extra caution. In Arizona, the utility-location process takes two working days. It’s free, it’s easy and yes, it’s the law. Speaking of the law, it applies any time you move, remove or displace earth, rock or other material in the ground. It applies if you’re using tools, equipment or explosives; and, it includes but is not limited to grading, trenching, digging, ditching, drilling, auguring, boring, tunneling, scraping, cable or pipe plowing and driving. If any of those activities are on your to-do list, be sure to contact us at least two working days in advance of your project by calling 811 or submitting your request online with the E-Stake option at Arizona811.com. Homeowners and contractors working at one residential address or a stand-alone business on a single lot can use the Single Address Ticket tool to create utility-location requests in a matter of minutes. Learn more at Arizona811.com. Please dig safely on 811 Day and all year long. 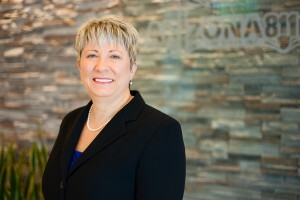 Sandra Holmes is the Executive Director of Arizona 811 (formerly Arizona Blue Stake), a nonprofit communication center that provides excavation notification services and stakeholder education that protects and promotes the welfare and safety of the community. Learn more at Arizona811.com.